"In the beginner's mind there are many possibilities, but in the expert's there are few." So begins this most beloved of all American Zen books. Seldom has such a small handful of words provided a teaching as rich as has this famous opening line. In a single stroke, the simple sentence cuts through the pervasive tendency students have of getting so close to Zen as to completely miss what it's all about. An instant teaching on the first page. And that's just the beginning. 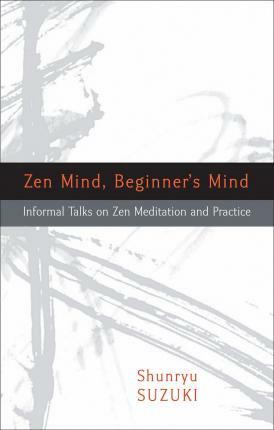 In the forty years since its original publication, Zen Mind, Beginner's Mind has become one of the great modern spiritual classics, much beloved, much reread, and much recommended as the best first book to read on Zen. Suzuki Roshi presents the basics--from the details of posture and breathing in zazen to the perception of nonduality--in a way that is not only remarkably clear, but that also resonates with the joy of insight from the first to the last page. Shunryu Suzuki (1904-1971) was one of the most influential spiritual teachers of the twentieth century and is truly a founding father of Zen in America. A Japanese priest of the Soto lineage, he taught in the United States from 1959 until his death. He was the founder of the San Francisco Zen Center and the Tassajara Zen Mountain Center. He is the author of Zen Mind, Beginner's Mind and Branching Streams Flow in the Darkness: Zen Talks on the Sandokai, and he is the subject of the biography Crooked Cucumber by David Chadwick.